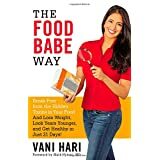 I have followed The Food Babe for a while now, so I was excited to hear that she was coming out with a book. The more I learn about the adverse effects of food additives, preservatives, artificial colors, etc., the more concerned I become about what I eat. More importantly, I am incredibly concerned about what I feed by kids. And, it is incredibly overwhelming to try to wade through all the information that is floating around out there! I really like Vani’s book, because she covers a lot of ground in one place. She talks about the research she has done on certain companies, restaurants, the effects of specific additives, etc. She also lays out a plan to start eliminating various chemicals from your daily diet. Finally, she concludes the book with recipes. It is a really nice, cohesive way of putting everything together in one place, which I find incredibly helpful. I have read other reviews that are not very positive, and I get it. She is a blogger, not a scientist or doctor. Some of the book reads more like a blog, but why wouldn’t it? It isn't supposed to read like an academic journal. She is reporting on her own work and findings, and that is exactly what you will read about in her book. I don’t know if I will ever get aaaallll the way over to The Food Baby Way, but I appreciate that she has molded her research into an action plan. It certainly makes navigating clean eating a little easier for me, and I really appreciate this … we busy moms need every bit of help we can get! I also think the work she is doing to expose these additives is incredibly important. I wish I could give a copy of this book to every single person I know. If you are looking to eat cleaner, reduce chemicals/preservatives/artificial dyes from your diet, The Food Babe Way will be a great resource for you.